Yesterday I got the day off work and spent the day with Cheryl, E and others at a wedding. What a beautiful day! Matt and Ursula (her mum’s an active member at HBC) were a neat picture of Christ and His Church (Eph 5:31-32). Was nice that many friends and family flew over from the UK to be a part. There were many personal touches that we enjoyed and appreciated such as bluebirds on the stationery, guests signing the English flag, bride and groom making their entrance to everyone blowing bubbles, the warm and touching speeches by the parents and the groomsmen. Another neat thing was that we carpooled up to Matakana (90 minutes drive from East Auckland) with Peter and Francelle and enjoyed two hours of conversation with them – so valuable! 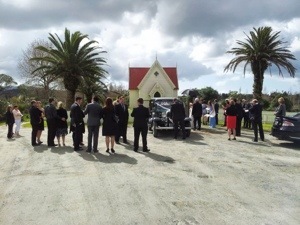 Peter presented a concise but sharp message from Gen 2:25 and Colossians 3:12-19, it was very personalised to the wedding couple and so wonderful to see two followers of Jesus making a commitment to image the gospel “till death do us part”. 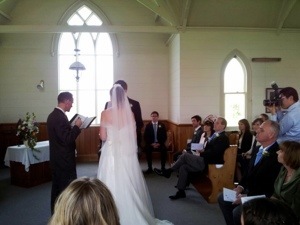 I also had the privilege of leading a few songs during the ceremony (yes, we had that song I don’t like, but that’s OK!). The best part for me was watching Matt and Ursula sing, and really just joining in with their sung worship. I think when a bride and groom are singing passionately to Jesus with thankful hearts, it speaks volumes, especially in front of family and friends who aren’t Christians. E was quiet during the service but oh so fidgety – Cheryl had to stop E from pulling the hair of people in front of her, touching their jackets etc. At the receptions, decided for lunch she didn’t want anything but chips either… so we ended her meal early. She got to see real horses (the wedding was held on a country park), a real fireplace, and lots of bubbles! 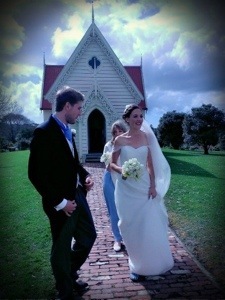 Love weddings – stressful but beautiful! This entry was posted in Marriage, Personal, William, Worship leading and tagged HBC, wedding on 29 August, 2013 by W C.
Someone asked us this recently. …but then had to stop. I had to admit I couldn’t remember them well. Even though they’re stuck on our fridge door, which we walk past every day! Thankfully, we’re reminded of our vows (in splendid colour!) from 1:40 – 2:10, and 2:58 – 3:40 of our wedding video. … only Jesus Himself can provide that sort of servant-hearted love! … only Christ can supply the day-to-day dying to self and living for the other that could possibly enable this! So for what it’s worth, Cheryl, everything we’ve been through so far has been worth it to get a front-row seat to the beautiful woman God is shaping you to be! Happy 3rd anniversary my love! This entry was posted in Marriage, William and tagged anniversary, wedding on 6 February, 2013 by W C.
It’s our 1st wedding anniversary today! So here’s a song that we both enjoyed this year. We’re not as young as the guys Andrew Peterson sings about when we got married – but these words speak of the same struggles, the same joys, the same realisation of utter dependence on God’s grace to hold us together, and to refine our lives in the process! We’re off somewhere exciting for lunch and dinner, probably. Looking forward to having a great time rejoicing in what the Lord’s worked in our lives so far. 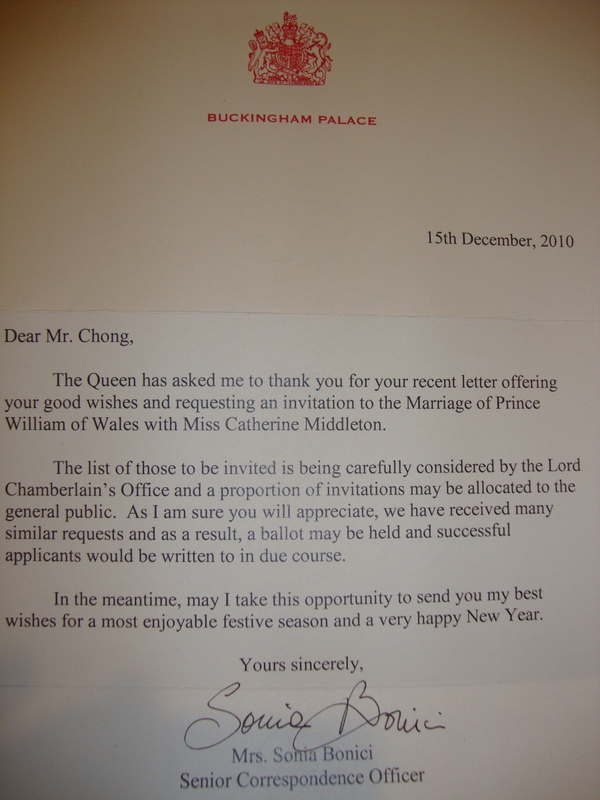 This entry was posted in Cheryl, Marriage, Song recommendation, William and tagged anniversary, wedding on 6 February, 2011 by W C.
The Queen has asked me to thank you for your recent letter offering your good wishes and requesting an invitation to the Marriage of Prince William of Wales with Miss Catherine Middleton. The list of those to be invited is being carefully considered by the Lord Chamberlain’s Office and a proportion of invitations may be allocated to the general public. As I am sure you will appreciate, we have received many similar requests and as a result, a ballot may be held and successful applicants would be written to in due course. In the meantime, may I take this opportunity to send you my best wishes for a most enjoyable festive season and a very happy New Year. P.s. : If you ever feel the urge to write to the Queen, these instructions may be of use. You will generally get a response, though usually written by one of Her Majesty’s correspondence officers. This entry was posted in Personal, William and tagged invitation, just for fun, Kate Middleton, Prince William, Queen, wedding on 9 January, 2011 by W C.